Everyone may be one fire, but there can only be one Burning Batsu! Unlike many of Capcom's other 3D efforts (specifically the Street Fighter EX games), Project Justice does actually take advantage of the fact that it is in 3D. It is possible to dodge in and out of the play field, move around an opponent, and generally do all the things one would expect to be able to do in a truly 3D fighting environment. While the system may not have the depth of Virtua Fighter (or even Soul Calibur), it is, at least, comfortably able to claim a place as a true 3D game, as opposed to a 2D game that simply happens to be rendered in 3D. In addition to the standard arcade and versus modes, the game includes a fairly conventional training mode, a league battle mode that that allows up to six teams to compete for points and a tournament mode that allows up to eight teams to compete in elimination matches moving towards an ultimate showdown for first place. An "Extra" mode lets players watch two computer-controlled teams duke it out, look around the 3D backgrounds, check out any of the arcade stories they have already played through (each school has a different story), play the background music and voices, watch the credits loop, or check out high scores from the game. Unfortunately, a minigame from the Japanese version that allowed players to build their own character has been cut from the American release. Capcom's music has never been its strongest suit, but Project Justice's music is surprisingly good. Catchier and more interesting than the music in a lot of Capcom's previous arcade offerings, the tunes in Project Justice suit the action well and are enjoyable to listen to on their own (if still not terribly memorable once the game is turned off). Boman dislikes violence and likes praying. He's bad at math and science and volunteers at church each Sunday. Just about every problem with Project Justice could be applied to Capcom fighting games as a whole. If Capcom's fighting system is one of Project Justice's biggest assets, it may also be one of its greatest liabilities. Despite the peculiarities offered in Project Justice, some gamers will find that ultimately the game is just another Capcom fighter. Innovation has never been one of the identifying characteristics of Capcom's fighters and this particular apple certainly hasn't fallen far from the tree. 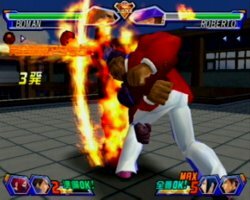 Players tired of performing fireballs, hurricane kicks, and the whole spectrum of moves that have formed the canon of modern fighting games are going to be bored playing Project Justice (although they still might have fun watching). Likewise, Capcom has always been notorious for coming up with the cheapest bosses known to the human race, and Project Justice follows lock step with that tradition. The Project Justice boss has moves no other character in the game comes close to matching, can pull off devastating combos with no warning, and moves roughly twice as fast as any other character. None of which is to say that the boss is necessarily that difficult to beat. He has a pattern, and players will learn it and learn to counter it. Still, it would certainly be nice to see a Capcom boss that fought based on intelligent AI, rather than grossly pumped up stats. Of course, if innovation and good bosses have been the two most missed elements of Capcom fighting games, then story must be number three. While individual characters often have very interesting (maybe even compelling) backgrounds, nothing ever seems to coalesce into a coherent narrative, and Project Justice, despite having an actual Story Mode doesn't do any better. While some issues may simply be a matter of mediocre translation, others simply have to be accepted as flaws in the basic story. Of course, most fighting fans don't play for the story, but Capcom clearly went to some lengths in this case to add one, and it contributes virtually nothing besides a way to unlock hidden characters. That's a wasted opportunity. A larger omission is the lack of the board game which is found in the Japanese version of the game. 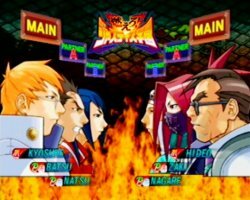 Capcom did not bother to translate the game and thus removed it from the US version of Project Justice. The board game was a very nice, cute addition to the game, and it's a shame to see it go. Seeing the super-deformed fighters racing to the end of a board game is quite enjoyable, and excising this bit of extra fun from the US edition is a bad thing, even if it doesn't impact the actual game. Capcom also removed the character edit, which allowed you to more or less create new characters. The company likely removed both of these additions because it would be a bit costly to translate and the low Dreamcast production run doesn't help, but it's still disappointing, especially given how much fun those modes are. A last complaint would have to be the "1-4 player" gaming the back of the jewel case claims players can engage in. In reality, play is limited to two players at a time. The game does recognize all four controllers, and allows them to be used during tournament and league modes, but play is still limited to two teams of three characters, each controlled by a single person. The same effect can be achieved with only two controllers and a little creative swapping. Whatever its shortcomings may be, Project Justice remains an incredibly entertaining game, bubbling over with personality and humor. Anything this much fun to watch, let alone play, should at least be given the benefit of the doubt. With a retail price of only $20.00, even casual fighting fans owe it to themselves to take a look. Highs: Great theme, fun and fast action, good fighting engine. Lows: Average graphics and audio, nothing really new or interesting.